For uniform cooking results, the USDA recommends cooking the stuffing outside of the bird. If you insist on stuffing the turkey, stuff loosely and follow the steps below. 1. Preheat oven to 325°F. Check the wrapper to see how much the turkey weighs and determine approximate cooking time (see chart below). Remove the giblet bag from the breast and remove the neck from the turkey cavity. No need to wash the turkey (see Wash Hands: Not the Turkey), pat skin dry with paper towels. 2. Mix stuffing and lightly fill cavity. Allow 1/2 to 3/4 cup stuffing per pound of turkey. It is safer to understuff than to overstuff the turkey. Stuffing expands during cooking. Refrigerate any leftover stuffing and bake in greased casserole during the last hour of turkey roasting time. 3. Place turkey breast side up on a rack in a shallow (about 2 inches deep) roasting pan. Insert meat thermometer in thigh (see Turkey Safety: Using a Thermometer). Add up to 1/2 cup water to the bottom of the pan, if desired. 4. Cover turkey loosely with a tent of heavy-duty aluminum foil. Cooking time takes longer for a stuffed turkey. For example, a 20 pound stuffed turkey will take 4 1/4 to 5 1/4 hours to cook. (See timetable below). 5. Remove the foil cover after about 1 to 1 1/2 hours of cooking to brown the skin. Brush with vegetable oil to enhance browning, if desired. 6. A whole turkey is done when the temperature in the innermost part of the thigh reaches a minimum internal temperature of 165°F as measured with a food thermometer. Check the temperature in the thickest part of the breast, the wing and the stuffing. The stuffing must reach 165°F or higher, if it is not, return it to the oven and continue cooking. 7. Check the internal temperature of the stuffing. Insert the thermometer through the cavity into the thickest part of the stuffing and leave it for 5 minutes. Or use an instant red thermometer which will register the temperature after 15 seconds. The stuffing temperature will rise a few degrees after the turkey is removed from the oven. If the center of the stuffing has not reached 165°F after stand time, return the turkey to the oven and continue cooking. 8. 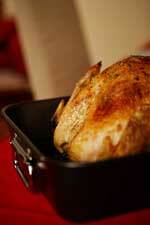 Allow turkey to set 20 minutes before removing stuffing and carving to allow juices to saturate the meat evenly. The USDA does not recommend cooking turkey in an oven set lower than 325°F.